How can a group function with great intelligence and teamwork to achieve organizational outcomes? Leaders deal not only with individuals one-on-one. They also deal with groups. Effective group functioning often requires the facilitation of a group's effective functioning by a leader, or several leaders. The set of skills that help a group learn to learn is called organizational learning. Group Conversations ­ Facilitate some meetings without an agenda. This provides each person with an opportunity to speak about important issues. Use a talking ball or stick. Storytelling ­ Create a team atmosphere of trust, mutual respect and other important values through storytelling. Orchestrate Fun Group Activities ­ Use improvisational music, games, drama and other fun activities. This will help people to get over hurt feelings and enhance community spirit. Make Passionate Presentations ­ Express your enthusiasm. Encourage the passion and enthusiasm of others. Open and Honest Communication  Encourage people to express themselves about problems and organizational issues. And develop policies and systems to make it safe to do so. 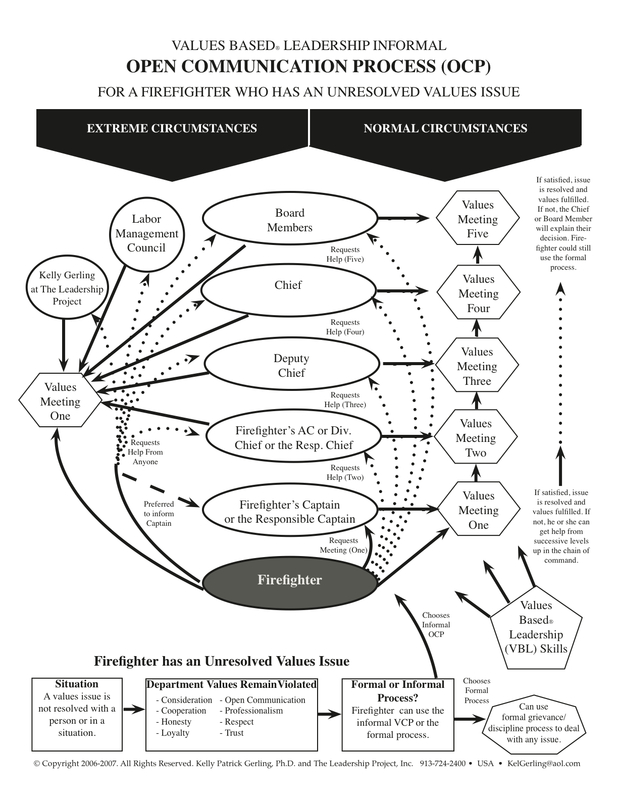 Here is a chart called the Open Communication Process Chart. It is tailored for use in a fire department for a firefighter.